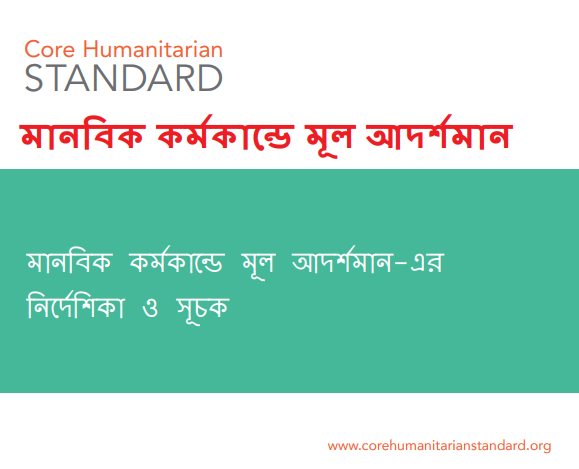 The Core Humanitarian Standard (CHS) Guidance Notes and Indicators is now available in Bengali language. The CHS management team would like to thank the Humanitarian Leadership Academy, and Meherun Nesa Jhumur and Nayeem Wahra at the Disaster Forum in Dhaka, with support from Hasina Zaman and Sharmin Ruba for preparing the translation. The CHS Guidance Notes and Indicators in Bengali will be an invaluable resource for humanitarian and development organisations working across Asia and worldwide. The CHS Guidance Notes and Indicators is now available in 11 languages on the Resources page of CHS website: Arabic, Bengali, Chinese, English, French, Spanish, Korean. Japanese, Khmer, Vietnamese and Swahili. The CHS management team also encourages interested individuals and organisations to translate the CHS Guidance Notes and Indicators into other languages. This helps disseminate the document more widely and supports the efforts of humanitarian and development actors to improve the quality and effectiveness of their responses. Those wishing to do so should first email info@corehumanitarianstandard.org for more information and approval from the CHS communications team.